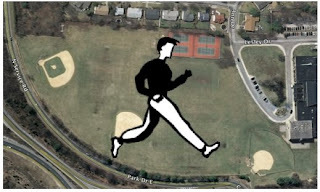 Yesterday I decided to try an alternative route starting with a run around the local middle school's field. The ground was still semi frozen and very uncomfortable for running. After about half a mile I peeled off and hit the service road that leads back into the neighborhood. I continued my run on the streets until I came upon the park that connects to the elementary school's grounds. These fields were also very bumpy so I exited back to the street for the remainder of my run. I had hoped that the additional stiffness of the Kutus would balance the uneven running surface of the athletic fields but it wasn't a comfortable experience and I was concerned about turning an ankle. I was pleased that the Kutus performed well on the street, different from the Turbulence 13s but still good. I ended up covering 2.5 miles at an average pace of 9:09. The Garmin 50 under reported the distance by about 2.8% but I still can't figure out how to correct for that using the calibration feature. Is it too early to think about Thanksgiving?